Denna produkt ger dig 4745 bonuspoäng. Buggy Typhon 6S V2 4WD BLX 1/8 Buggy RTR 2016. 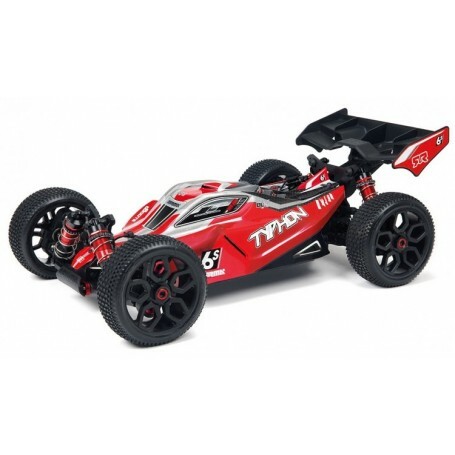 The TYPHON 6S Speed Buggy is the ultimate performance 4WD bashing machine. Capable of tackling the most challenging conditions, from your local race track to a mud drenched bashing spot, the TYPHON 6S is packed with high-power features to blast you into new realms of RC fun. Styled to turn heads, from the local bashing spot to the club race track, the TYPHON 6S looks serious, straight from the box. Unleashing the equipped BLX brushless system will allow you to master 6S LiPo battery power on a wide range of extreme surfaces. The TYPHON 6S is ready for action. A low-profile Polycarbonate body shell, and race-inspired multi-spoke black nylon wheels, are combined with a high-downforce rear wing for refined performance in the most extreme driving environments. With track-inspired handling and super-tough bashing build quality, your TYPHON 6S will put you in control of exhilarating RC driving action, straight from the box. Rip up your local dirt bowl, blast across the mall parking lot, launch huge jumps at the skate park. The TYPHON 6S can do it all.